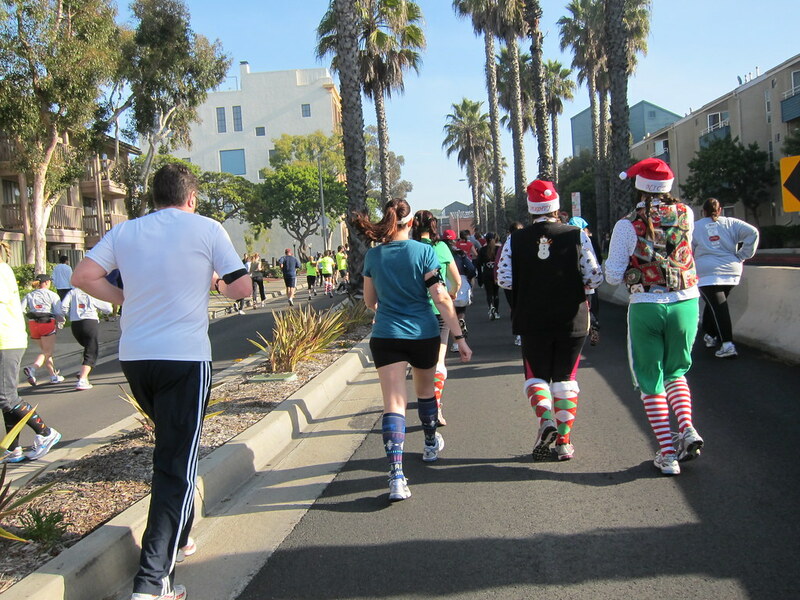 The Green Girl did 'LA's Largest Holiday Running Event', the Santa Monica - Venice Christmas Run, yesterday. The Christmas Run benefited the non-profit organization, Partners In Malawi. Partners In Malawi is an HIV/AIDS care organization that supports the Partners in Hope Medical Center in Malawi. The Partners in Hope Medical Center offers free HIV testing, counseling, and treatment. The organization also created the Our Action for Behavior Change program that works with 40 schools to educate the youth of Malawi about HIV prevention. The Tikambe Youth Center was also established to provide 'youth friendly' HIV testing. I carpooled with Rad Runner Girl and we met up with our friend, Janey. For the first time ever, I decided to get into the holiday spirit with some Christmas tree knee socks. It was an unusually foggy morning. The 10k kicked off at 7:30 am but the 5K didn't start until 9:15 am, so we wandered around the booths through the mist and collected free goodies. The race was the consummate moving Christmas party. There were Santa Hats and ugly sweaters galore. 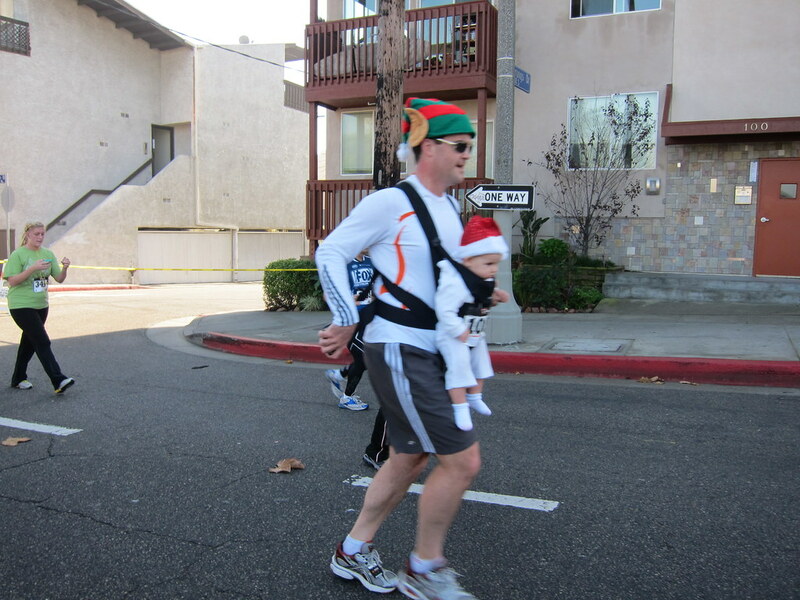 I even saw a giant elf running with a baby Santa. Unfortunately for me, my Christmas tree socks were not conducive to running and my festive feet were sliding around too much - even though I'd tightened my laces before the race. I'm accustomed to wearing thicker socks and I believe the thin holiday socks were too slippery to be worn with my orthotics. My shins were throbbing before I hit the Mile 1 marker and I ended up walking the majority of the remainder of the race. Fortunately for me, it was a fun race with a scenic course that took us down the Venice Beach promenade past all the street vendors and booths. 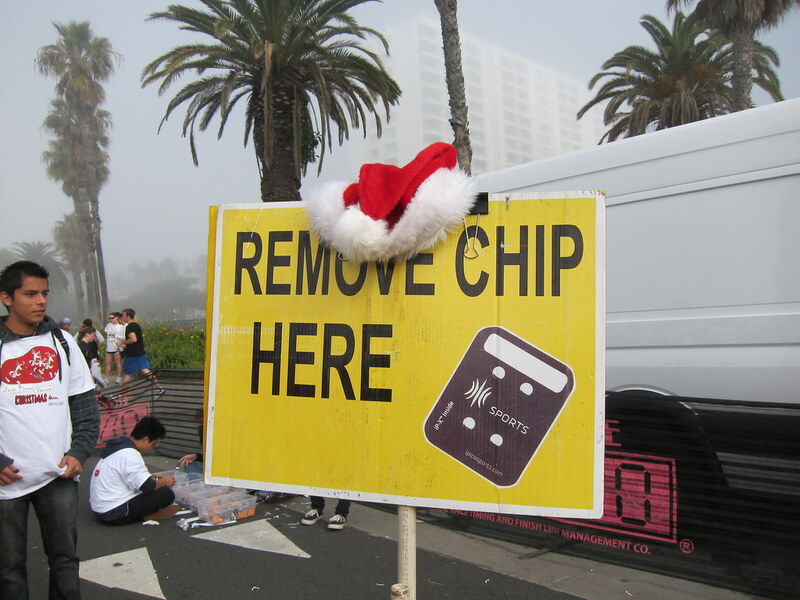 The race was well organized and there were lots of volunteers full of holiday cheer. After I'd crossed the Finish Line, I changed into my awesome Santa Monica - Venice Christmas Run technical shirt. Despite the epic sock fail, I had a lot of fun and it was a great way to start off the Green Girl's Holiday Race Series. A running Christmas party...how fun! I'm sorry your socks didn't cooperate (they looked cute though). Green Girl--I love that you always take a moment to highlight the good causes the races support! Giving you a pat on the back. What fun! Now that's one pavement race I might run. I know what you mean about slipping around on orthodics -- has happened to me in a mud run. It actually hurt. Looks like you made the best of it. Merry Christmas! Super fun! Even though the socks didn't cooperate I give you extra festive style points! Another fun race. You've done so many fun events and races this year, awesome! Here in SA there are lots of fun races over December but because it is summer here they tend to be more of a beer drinking type thing. That is not totally my idea of fun racing so I skip them most of the time. Fun is what matters in events like this even if socks don't want to cooperate. glad you had fun green girl! dang - i just went and bought some fun socks for the cupcake run - wanted everyone to get on board with that. maybe i'll wear another pair over or under them. there were lots of girls running the 1/2 marathon yesterday in them. These pics were FAB and I think the socks...slippery or not...were flippin' awesome. Happy Holidays, CasITa-to-5k! Happy Running!